Includes historic documents and photographs, suitable for research on civil rights history. This book is formatted for persons with low vision. "Got your book yesterday. It is AMAZING! - Brava! I really couldn't put it down. 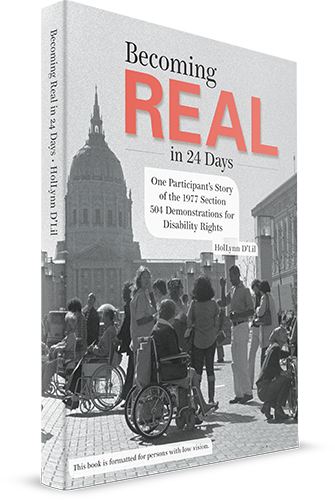 The sit-in happened before I was all that involved in disability rights - or I was just starting out here in Louisville with a group but I really knew nothing about national stuff. It was only after The Rag started and I began to know the national scene that I realized what an amazing thing people had done in '77. Of course Mary Jane told me all about it, as did others, but your photos and text brought it home in a way that nothing had before. So many people - who looked SO YOUNG! Judy, Ed, Mary Lou Breslin, Mary Jane - almost every page I turned I'd see somebody I had known or known about! So thank you so much for sending it - and more than that, thank you for DOING IT! It is a great commemoration of a great page from history. All the best,"
Download a preview of the book - Becoming Real in 24 Days and be added to our list for future book previews and notifications! She has participated on committees for the U.S. Access Board, the National Fire Protection Association, the California Division of the State Architect, the Secretary of State, the California Department of Housing and Community Development, the State Historical Building Safety Board and the State Fire Marshall.